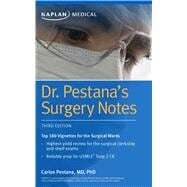 by Pestana, Carlos, M.D., Ph.D.
Celebrated by medical students for over a decade, Kaplan's pocket-sized Dr. Pestana's Surgery Notes is the highest-yield surgery review for the the shelf and USMLE Step 2 CK exams. Designed for portable prep, Dr. Pestana's Surgery Notes fits perfectly in your lab coat so you can refresh your knowledge in between cases. You'll get the most concise, up-to-date review that incorporates recent changes in medical guidelines, including HIV status, organ donation, urological emergencies, classification of shock, pelvic fracture, ARDS, and cardiothoracic surgery. Carlos Pestana, MD, PhD, is emeritus professor of surgery at the University of Texas Medical School at San Antonio. Ranked #1 in his medical school class, Dr. Pestana has a doctorate in surgery from the University of Minnesota and did a 5-year surgical residency at the Mayo Clinic. He has received over 40 teaching awards and prizes for teaching excellence. In the early 1990s he was a member of the Comprehensive Part II Committee of the National Board of Medical Examiners that designed what is now the clinical component of the USMLE Step 2 exam. Dr. Pestana is also the author of Fluids and Electrolytes in the Surgical Patient, which has been translated into Spanish, Italian, and Greek.